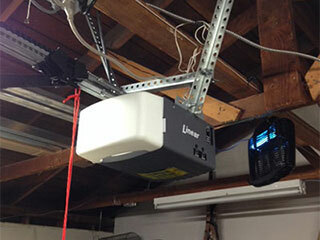 The chain drive garage door opener is one of the most common garage door openers. This is partly because these units are usually cheaper than models that employ other types of drive-systems. Still, openers of this type are prone to certain issues which must be resolved quickly. Since they are usually comprised of more moving parts, they do require more frequent maintenance in order to continue to function optimally for a long time. Chain drive openers are very similar in style to belt drive garage door openers, with the main difference between them being that instead of running a rubber belt along a track, these units use a chain in order to pull the garage door up with it. The pulling action is provided by a motor, which usually ranges from ½ to ¾ horsepower. The chain is virtually the heart of this opening system, and therefore it requires the most attention. There are two forms of chain maintenance which must be performed on a regular basis to prevent a lot of different problems. The first is regular lubrication maintenance. This will keep the chain greased and operating smoothly. Spraying it with a special lubricant will reduce the amount of noise the chain makes and also reduce the friction between its moving parts, preventing - or at the very least delaying - breaks, as well as increasing the lifespan of your opener. The chain can also develop too much slack and will need to be tightened and adjusted just enough that it is taut but not overstretched. Extra slack can prevent it from being able to raise your garage door all the way up. Even if you regularly grease the chain to reduce its friction, it will still rattle as it moves along the rail. This can shake loose the screws and the hardware fastenings that are binding the rail to the roof, door, and motor. Therefore, we advise that you make sure to take some time, perhaps concurrent with the lubrication maintenance, to visually inspect these components and carefully test them with a wrench or screwdriver to make sure they are all tightly impacted. A loose component can cause a major issue, so regular inspections are important for preventing big problems. There are several maintenance routines that you can perform by yourself in order to ensure your chain-drive opener continues functioning optimally. However, the moment you encounter a major problem you must call our experts at Garage Door Repair Evanston right away. Leave the dangerous tasks to our professional technicians.